Visual Paradigm Community - the Best #1 FREE ERD Tool in the market! Visual Paradigm Community Edition was launched since 2004 to provide a free UML software for sole non-commercial purpose, supporting users who was making their first steps in UML modeling, and who need a free and cross-platform UML modelling software for personal use, such as applying UML on student projects. UML modelling tool free for all sorts of non-commercial purpose. Supporting the 13 UML 2.x diagrams and ERD diagram. 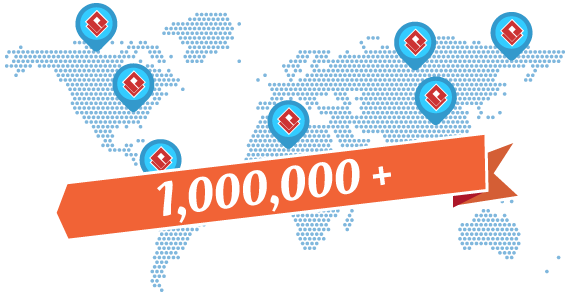 We are adopted by over 1 Million installations around the globe, and is still growing. What is Entity Relationship Diagram? Entity Relationship Diagram, also known as ERD, ER Diagram or ER model, is a type of structural diagram for use in database design. An entity-relationship (ER) diagram is a graphical representation of entities and their relationships. Entities are the things we need to store data about. It's an aspect of your business that needs to be stored, such as a book or author, customer or publisher, for example. In the diagram, entities are represented by boxes with lines consist various attributes. entities link up each other according to the relationships between them or how they interact with each other. Relationships are sometimes referred to as cardinalities, which describes the interactions numerically but let's simply call them relationships. Deep insight to the information that needs to be contained in the database. Visual representation is very easy to learn and understand. It serves as a documentation tool. It is used to represent and communicate the logical structure of the database to the non technical users. Very easy to transfer the construct into the relational tables. Acts as a blueprint of a database. But even with all these benefits above, Visual Paradigm Community is free for all sorts of non-commercial use, since 2004, and for now & forever! Traditionally developers spend a lot of effort in saving and loading objects between memory and database which makes the program complicated and difficult to maintain. Visual Paradigm simplifies these tasks by generating a persistence layer between object and data models. Visual Paradigm generates object-relational mapping layer which incorporates prime features such as transaction support, pluggable cache layer, connection pool and customizable SQL statement. With this mapping layer, developers can keep away from mundane implementation work and focus on the business requirements. Visual Paradigm provides a true model driven platform for application development. Visual Paradigm allows developer not only to start from creating the models by using UML Class Diagram or Entity Relationship Diagram tools (ERD tools) to generating the executable persistence layer from the models, but also to modify the entity-relational model which comes from reverse engineering an existing database, transform into object model and generate persistence layer. With the sophisticated model-code generator, the persistent model will be updated automatically according to any modification. Visual Paradigm supports a wide range of database, including Oracle, DB2, Cloudscape/Derby, Sybase Adaptive Server Enterprise, Sybase SQL Anywhere, Microsoft SQL Server, PostgreSQL, MySQL and more. Visual Paradigm also promotes an easy migration between databases by enabling the same set of ORM Java objects to work with different databases and transforms the proprietary data type that suit the default database specified. Visual Paradigm allows you to reverse engineering Java classes and Hibernate models into the persistent object model. Developers can transform the persistent object model to data model and redesign the models for further development. Visual Paradigm is not only a standalone application, but also integrated to the major Integrated Development Environments (IDEs), including Eclipse, NetBeans, IntelliJ IDEA and Visual Studio, which results in streamlining the entire model code- deploy software development process. An award-winning modeling software that features UML, SysML, BPMN, ERD, DFD and more. 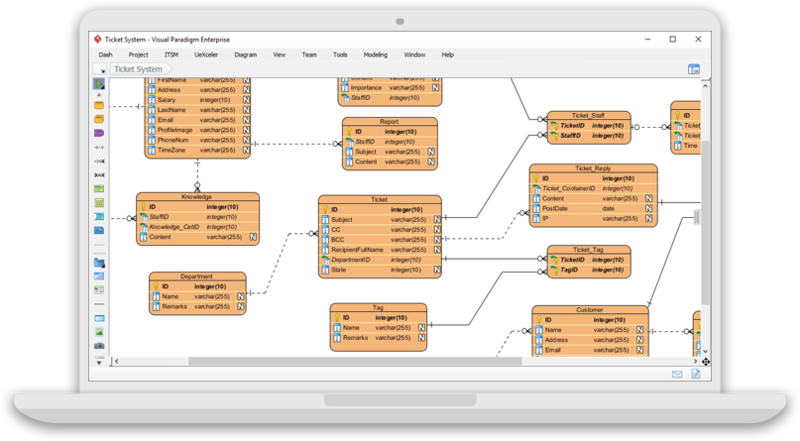 Visual Paradigm Modeler makes modeling easy and fast. Who's using this great UML software? Visual Paradigm are trusted by over 230,000 people in companies ranging from small business to Fortune 500 companies, universities and government units.